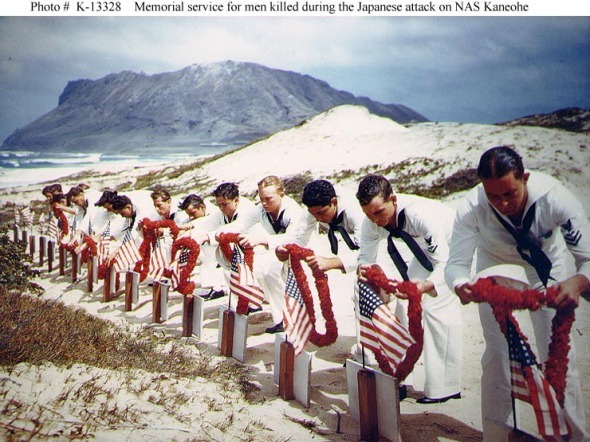 Following Hawaiian tradition, Sailors honor men killed during the 7 December 1941 Japanese attack on Naval Air Station Kaneohe, Oahu. The casualties had been buried on December 8. 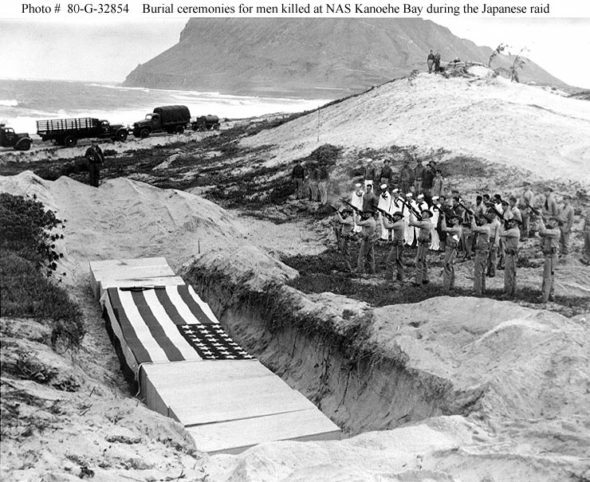 This ceremony took place sometime during the following months, possibly on Memorial Day, May 31, 1942. (by Paul Greenberg, Townhall) – Some memories never fade, and shouldn’t. “I was a newspaper delivery boy for the Hartford Courant during the fall of 1941. During that time, the Courant was holding a subscription drive. Each paperboy who signed up a new subscriber was invited to a banquet dinner at the Bond Hotel in Hartford. The award dinner for hundreds of delivery boys was held late in the afternoon of December 7, 1941. In addition to the dinner, the Courant arranged entertainment for us. There were clowns, juggling and local sports heroes. “In the midst of the festivities there was a lot of commotion on the stage. Eventually someone came on stage and announced that the Japanese had attacked Pearl Harbor. Many of us had no idea where Pearl Harbor was located. The speaker explained the importance of the naval base at Pearl Harbor. Being paperboys, we were also informed that the Hartford Courant would be publishing an evening Extra edition that would be published as additional information was received. We were asked to report to our normal newspaper delivery location to wait for the special edition. “I took the bus back to my usual delivery location in West Hartford and waited and waited. When the Extra edition did not arrive, I joined other young paperboys and took the bus back to the Hartford Courant at State Street in Hartford to wait for the edition to come off the press. When we arrived at the Courant building, there were stacks and stacks of papers waiting to be delivered. At that point we took the papers and ran into the streets of Hartford delivering papers to a city eager for news of Pearl Harbor. To those who lived through that time, and still remember the Americans who didn’t, that day and that war still lives. Seared into memory. Not enough of us today will think of those Americans who gave their lives in the jungles of the Pacific or in the skies above Europe, who fought in North Africa or on the beaches of Sicily and Normandy or wherever they were sent to defend not only their country but the cause of freedom around the world. Cut down before their time, they never grew old. Still young in their fresh soldier boy’s uniforms or coats of Navy blue, their pictures still stand somewhere almost lost among all the others atop crowded mantles and chifferobes across the country, their gazes fixed on us from the past. If we would only look. And learn. The now aged veterans who survived that terrible conflict might have been with Jimmy Doolittle for 30 minutes over Tokyo, a daring raid that revived American spirits in the midst of initial defeat after defeat and retreat after retreat. Or they might have made it to the victorious end aboard the battleship Missouri, where the unconditional surrender was signed after those blinding flashes that destroyed the populations of whole cities. Wherever they are, they will remember this day — as we should remember them. The country would experience another Day That Will Live in Infamy on September 11, 2001, and once again resolve to see the struggle through to the inevitable victory, so help us God. Yet the memory of that day, too, like the country’s resolve, already fades. Appeasement comes back into fashion if by more polite names. Once again Western statesmen draft diplomatic deals and issue press releases proclaiming peace in our time. Once again, defense budgets are cut as America withdraws from the world stage. With the usual results: Aggression goes unchecked, a bloody civil war rages in Syria as it once did in Spain, fanaticism prospers, and the next Day of Infamy is invited while America sleeps. Today the memories indelibly etched in a young paperboy’s mind on December 7th, 1941, and now part of his family’s heritage, come back strong, if only for a passing day. Those memories need to be kept alive, powerful and vivid, from generation to generation, and their lesson remembered. There are many other Robert Cunninghams in this still great country, this sleeping giant more than one vainglorious aggressor has made the mistake of awakening, and their stories need to be told and preserved, too. Which is another reason why the veterans of that terrible war, the diminishing number of them we still have with us, should record their memories for posterity. Because they’re all part of your heritage, America. Originally published December 7, 2013. Reprinted here on December 4, 2014, for educational purposes only. May not be reproduced on other websites without permission from Townhall. 1. The purpose of an editorial/commentary is to explain, persuade, warn, criticize, exhort, entertain, praise or answer. What do you think is the purpose of Paul Greenberg’s editorial? Explain your answer. 3. What encourages you most about Mr. Greenberg’s commentary? CHALLENGE: Listen to President Franklin D. Roosevelt’s entire Dec. 8, 1941 “Infamy” speech to Congress (see video under “Resources” below. -Listen to FDR’s speech to Congress at history.com/audio/fdr-asks-congress-to-declare-war-on-japan#fdr-asks-congress-to-declare-war-on-japan.